His wife Lady Naipaul called him a “giant in all that he achieved”. She said he died at his home in London “surrounded by those he loved having lived a life which was full of wonderful creativity and endeavour”. Geordie Greig, editor of the Mail on Sunday and a close friend, said his death leaves a “gaping hole in Britain’s literary heritage” but there is “no doubt” that his “books live on”. It is universally agreed that Sir Vidia Naipaul was a great writer of the English sentence; a master stylist and story-teller with a cold, clear eye for the ironies, tragedies and sufferings of mankind. But here all agreement stops. For his many supporters, his fiction had merciless comic clarity and his travel writing a terrifying honesty – refusing to glamorise or idealise the developing world. They hailed him as a towering intellect – delivering an original, scorching critique refreshingly devoid of political correctness: attacking the cruelty of Islam, the corruption of Africa and the self-inflicted misery he witnessed in the poorest parts of the globe. For his numerous critics, Naipaul’s writing was troubling and even bigoted. They recognised his literary gifts but saw him as a hater: an Uncle Tom who dealt in stereotypes, paraded his prejudices and bathed in loathing for the world from which he came. Certainly, he gave cause for their grievance. “There probably has been no imperialism like that of Islam and the Arabs”, he once declared. He was scornful of the Caribbean, wrote that Africa would revert to the ‘bush’ and often veered towards unapologetic misogyny. “I read a piece of writing and, within a paragraph or two, I know whether it is by a woman or not,” he told one interviewer. “I think (they are) unequal to me.” Women were narrow and overly sentimental, he declared. Jane Austen, especially, did not come up to snuff. His fellow Nobel Prize winner, Derek Walcott, was scathing. Naipaul wrote beautiful prose, he said, “scarred by scrofula” and “a repulsion towards Negroes… a physical and historical abhorrence that, like every prejudice, disfigures the observer”. The academic, Edward Said, bridled at the attacks on Islam – saying he found it hard to believe any rational person would attack entire cultures on such a scale. In person, Sir Vidia could be affable. But, just as often, he was as haughty, irascible and quickly provoked to bile. He enjoyed epic feuds with friend and foe, acted unspeakably to women and gloried in a general lack of sensitivity to all who crossed his path. When Salman Rushdie went into hiding after The Satanic Verses, for instance, Naipaul described the fatwa as “an extreme form of literary criticism.” Then he threw back his head and laughed. 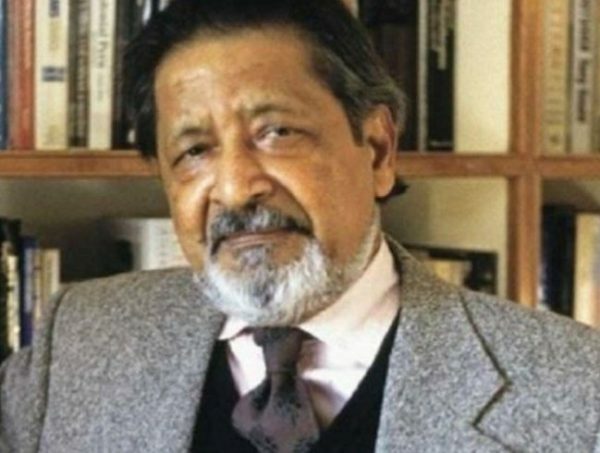 Vidiadhar Surajprasad Naipaul was born in rural Trinidad on 17 August 1932. The island of his birth was a complicated post-colonial patchwork of racial tensions and subtle hierarchies. His grandparents had been labourers: part of the great nineteenth-century Indian diaspora who had settled in the Caribbean. The young Vidia was raised as a Hindu, part of a displaced community within a plantation society. It was a blend of histories, customs and ethnic identities which later formed an important part of his work. Naipaul’s father, Seepersad, was a journalist for the Trinidad Guardian who revered Shakespeare and Dickens. He would read the great works of European literature aloud to his children – giving the young Vidia an burning ambition for writing, a “fantasy of nobility” and a “panic about failing.”. He attended the Queen’s Royal College, proving himself an able student. On graduating, he won a government scholarship giving him entry to the Commonwealth university of his choosing. In 1950, he arrived in Oxford. Image copyright Meager Image caption Naipaul suffered from loneliness and depression during his time at University College, Oxford. He found it less than intellectually stimulating. University College was a time of poverty and terrible loneliness. Isolated and unsure of his future, Naipaul became severely depressed. On an impulse, he took a trip to Spain where he quickly ran out of money. There was a frustrated suicide attempt when the gas meter ran out. His saviour was his father, with whom he kept in touch by letter: a correspondence Naipaul later published as Letters Between a Father and a Son (1999). With a growing emotional and physical detachment, he began to write about his childhood. His first three books – The Mystic Masseur (1957), The Suffrage of Elvira (1958) and Miguel Street (1959) – were set in the Caribbean and published in quick succession. Then came his undoubted masterpiece. A House for Mr Biswas took more than three years to write and, by the time of completion, he knew much of it by heart. But beneath the masterful comic writing lay such a series of raw emotions, he barely ever looked at it again. It was a sprawling, Dickensian family chronicle about one man’s dreams of independence. Mr Biswas was from Trinidad, continually striving for elusive success. He marries into an overbearing family but, without a house, cannot be the author of his own destiny. He struggles to build it; casting off his decaying relations, creating his freedom and establishing self-respect. Above all, it was the writer’s attempt to come to terms with his own identity and the pivotal figure in his life: his father. The book was a sensation, published to global acclaim in 1961. But Naipaul felt exhausted and done, for now, with writing literature. He spent the next few years travelling in the Caribbean, India and Africa – describing what he saw and reaching for a greater understanding of his own, displaced identity. His writings offer a personal notion of history as a series of tragic and haphazard upheavals, leaving “half-made” developing worlds in their wake. An Area of Darkness (1964) chronicles India. Naipaul has only contempt for westerners looking to the sub-continent for a spiritual awakening. Instead, he saw only ugliness and a smug refusal to recognise the horror of the “narrow, broken lanes with green slime in the gutters, the chocked back-to-back houses, the jumble of filth and food and animals and people, the baby in the dust, swollen-bellied, black with flies, but wearing its good-luck amulet”. In Africa, he took up a writer-in-residence fellowship at a university in Uganda – writing The Mimic Men (1967): a novel charting the struggles of Ranjit ‘Ralph’ Singh to balance his personal life and political ambition. Combining elements of both fiction and non-fiction, it satirised, as the title suggests, West Indian efforts to mimic the behaviour of their former European masters. He travelled widely about the continent, often depicting its life as bleak and its people primitive. In A Free State (1971) won the Booker Prize with its portrayal of a violent, post-colonial continent attracting young, idealistic whites in search of sexual freedom. A young American, Paul Theroux, often joined him on his journeys. Years later, Theroux discovered a book he had given Naipaul in a second-hand bookshop. Offended, he published Sir Vidia’s Shadow, a book depicting his former friend as “a grouch, a skinflint, tantrum-prone, with race on the brain”. The result was an epically bitter 15-year feud. Naipaul’s career saw bursts of stunning creativity laced with long periods of writer’s block. Highlights included The Loss of Eldorado (1969), Guerillas (1975) and A Bend In The River (1979) – a picture of post-colonial Africa spiralling into hell. He swung his gaze on Islamic fundamentalism in the Believers (1981). One New York Times writer observed that it bore an antipathy to the religion so naked “that a book taking a comparable view of Christianity or Judaism would have been hard put to find a publisher” in America. In his later years, he entered an autumnal phase with The Enigma of Arrival (1987) and A Way in the World (1994), combining personal experience (though denying it was autobiographical) with the broad historical sweep of post-war migration from developing world. Sir Vidia Naipaul will be remembered as a magical craftsman of English prose. He also believed the novel is “dead”. He leaves behind a complex, challenging library of work which – despairing of the limitations of fiction to describe reality – occupies a space between imagination, travel-writing and autobiography in his attempt to capture the complexities of the modern world. He saw himself as a lone, stateless observer; free of ideology, politics and illusion. To his champions, he had few equals. But to his detractors, Naipaul was essentially political; bearing witness against the post-colonial world with great writing but shielded from criticism by virtue of being ‘one of them’. « If Joint Opposition MP’s Want Opposition Leader Post They Must Have Courage To Resign From UPFA/SLFP and Face Risk of Losing Their Parliamentary Seats.